My favorite chapter would be, “The Holy Spirit Teaches” because this one discussed the importance of listening to the Holy Spirit and His ultimate guidance. We receive the Holy Spirit when we accept Jesus as our Lord and Savior and repent for our sins. The author shared countless passages about who the Holy Spirit is. In Ephesians 14, we learned He is a counselor, comforter, and teacher. In this chapter, they also covered how beneficial worshiping God truly is and the different ways people worship God. Michelle also shared in this chapter that they felt it was time to remove the video games her church allowed the children to play and instead create a worship center filled with a prayer wall. I liked how she revealed how it impacted a small boy and how he was so excited to share how much closer to God he felt. I also liked how the authors included at the end of this chapter ideas on how to create a prayer wall in your home and theses are really creative to encourage your family and church to pray for others. I would recommend this wonderful book to anyone who is seeking a resource to improve and transform their family ministry. I strongly believe if church leaders would apply these seven principles to both their home life and their church we would dramatically reach more people for Christ and they would have a deeper relationship with their Creator. I liked how each chapter included a ministry assignment and had tons of questions to assist readers into comprehending the material. If you’re looking for an excellent book on refining your ministry and growing deeper in your walk with God, then read this book! 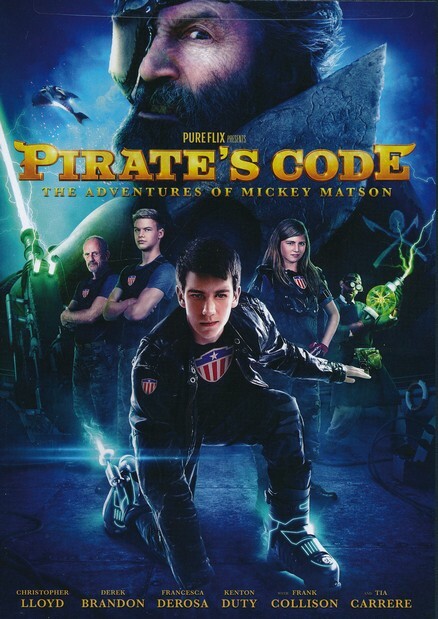 Pirate’s Code is the second movie in the film series, “The Adventures of Mickey Matson”. This movie features stars like Christopher Lloyd (famous for his role in playing Fester Addams in The Addams Family movies and Back to the Future), Kenton Duty (famous for starring in Disney’s TV Show Shake it Up! ), Frank Collision (played in Dr. Quinn, Medicine Woman), Patrika Darbo (played Nancy Westley in Days of Our Lives), Derek Brandon, and Francesa Derosa. Pirate Code follows the voyage of Mickey Matson and his best friend Sully. They have been summoned again by the Secret Order of the Patriots to join the important mission of stopping the corrupted Admiral Ironsides and his pirates. Admiral Ironsides is inventing an electromagnetic pulse weapon that will wipe out of the world’s technology and cause the world to erupt in chaos. I would recommend this awesome movie to anyone who enjoys action packed movies especially young teenagers. I haven’t seen the first movie in the series but it can certainly be a standalone title. I was able to watch it and understand the film and enjoy it. I liked how the movie was clean of curse words and is very family friendly. There was only some fighting scenes but nothing was too graphic. Parents can sit back and let their children enjoy this film and not have to worry. I really liked how they have actors and actresses that the older generation will recognize while watching the film as well as some younger actors that our kids love. It had a great mix of cast members. I have always enjoying watching movies Christopher Lloyd has played in especially The Addams Family and I was excited to see he was starring in this one. I also liked the many different technology devices and I thought they did an excellent job at appearing to the younger teens. If you’re looking for a new family friendly summer movie, then check out this one! In You Can, You Will, Joel Osteen shared eight different qualities that will radically change a believer’s life and assist them in living the abundant life. Some of the eight qualities are, “Keep Your Vision in Front of You”, “Run You Race”, “Expect Good Things”, “Stay Passionate”, and much more. My favorite chapter was, “Keep Your Vision in Front of You” because this one discussed how critical it is to have a vision for your life. Joel reminded readers that even the scriptures declare the danger of having no vision and how people will perish. I really enjoyed how Joel encouraged readers to have something in front of them that they see every day that will remind them what they are believing God for. He suggested for the single people to have an empty photo frame or set an extra plate. If you’re dreaming of attending college, he recommended you buy a college apparel to wear. He also stated to go ahead and thank God for answering your prayers. He shared a touching story about his brother-in-law, Kevin and his sister, Lisa and how they struggled to conceive a child. They both desperately wanted to have a baby. One day, a sample pair of diapers from Huggies arrived in their mail box and they didn’t order them. Kevin believed this was a sign from God. He had a strong desire to have twins because he has a twin and he believed that they would have twins. He kept the diapers as a reminder that God was able and He could answer their prayer. A couple of years later, they received a phone call and the lady asked them if they wanted to adopt two twins. God miraculously answered their prayer. I really connected with this story and this has encouraged me to keep believing for my desires in my heart and keep the vision in front of me. Some of my dreams is to get married and have children. My mom actually has an empty photo frame in her living room where she will put my future wedding photo. I also purchased a nice desk decoration that stays Hebrews 11:19 on it where when I see it daily I am reminded that with God all things are possible. I would recommend this life changing book to anyone who is desperately needing some much needed encouragement and they are ready to unlock eight qualities that will change their entire life. I enjoyed how honest and inspiring Joel Osteen was in this book and it helped me to get my expectations and hopes back and to stand strong and believe that God is more than able to answer the desires in my heart. I immensely loved how Joel Osteen shared the story about Jim Carrey. When Jim Carrey was a young man and poor, he wrote himself a check for ten million dollars for acting services. He didn’t have ten million in the bank. He had a huge vision for his life to become an actor. He put the check into his wallet to keep him encourage and to never give up on his dream. And years later he is a very rich millionaire and a famous actor. I also liked how he explained the importance of excellence and passing the small test. He stated that one way to live with excellence is when we don’t want something in a store we should return it where we correctly found it including the shopping cart. He reinforced how God see everything and how others notice how Christians act. I highly recommend this book and if you’re looking for an impactful book to read, then read this one! 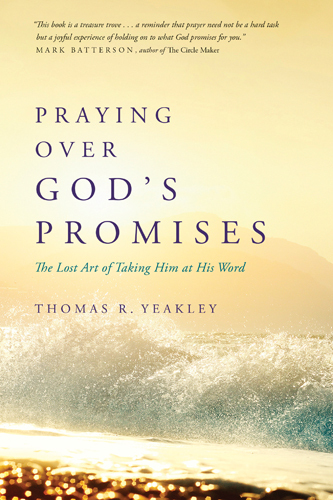 In Praying Over God’s Promises, Thomas R. Yeakley has written an excellent book about the immeasurable promises found in God’s written Word. He began the book by sharing that there are different types of promises: general, specific, conditional, and unconditional. An example of a general promise would be John 3:16 and God sending His own Son and whoever believes in Him will receive eternal life. Another example would be Ephesians 6:2-3 which tells us the importance of honoring our parents and our reward will be enjoying a long life. He also revealed how he relied on the promises of God when they were expecting their first child. They just graduated from college and they were struggling to save up extra money. They choose to depend on God to assist them in buying the needed items for raising a child. They believed the mighty promise found in Philippians 4:19 which declares that God will supply our every need. God miraculous provided every single item they needed for the new baby during this time. One of my favorite chapters was called, “Theology of Promises” because this one discussed how God promised to Abraham that He would make him a great nation and He will bless him and curse people who were against him (Genesis 12:2-3). This passage lead Thomas in to asking God to let him meet people in every continent and be able to disciple there. He has already made it to four of the seven continents. It also contained helpful references on where to find in scriptures where God fulfilled his promises to different Bible characters such as: Nehemiah, David, Joshua, Paul, and much more. This is especially helpful in seeing how God came through for His people time and time again and how He is still on the throne and able to be amazing things! I would recommend this marvelous book to anyone who enjoys learning more about God’s written Word and they are wanting to learn about His promises for their lives. This book taught me that there are many commands, principles, and promises found in the Bible and they can literally change our entire life and assist us in standing strong on His Word when the hurricanes of life try and break us down. 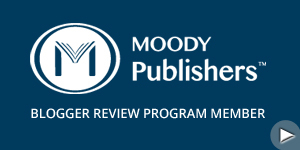 I liked how the book included many scriptures verses and a helpful appendix on certain topics listing scripture references. I was also deeply reminded and touched when he discussed how critical patience is and God’s timing is always right and patience gives us time to build our faith while we are waiting for God’s answer. If you’re looking for an impactful book about God’s promises, then check this one out!